Not to be confused with the latter battles 1st Siege of Le Quesnoy (1712), 2nd Siege of Le Quesnoy (1712) or Capture of Le Quesnoy (1918). The Battle of Le Quesnoy (Le Quesnoy, Hainault, 12 November, 1568) was fought between a mostly German army supporting the Dutch rebels and the Spanish Habsburg army. In October 1568, William of Orange had invaded the Spanish Netherlands with a considerable army. Despite capturing some fortified towns, he did not manage to face the Spanish Army under the Duke of Alva in a decisive battle. Manoeuvering to meet up with a French Huguenot army, Orange lost his rear-guard at the Battle of Jodoigne. On about 23 or 24 October, near Wavre, Orange's army met the Protestant Huguenot force from France led by Francois de Hangest Sieur de Genlis & d'Abbecourt. It was disappointingly small, about 2,000 infantry and 500 cavalry (estimates of the total vary between 2,000 and a probably exaggerated 5,800). The French were commanded by Francois de Hagest, Genlis himself, and Sieur de Morvilliers, assisted by the Barons of Ranty, Mouy, Autricourt, Desternay, Requires, and la Personne. The commander of the French infantry was Capitain Poyet. Orange's army was mostly from Germany, and with winter developing, they needed to get home. The river Meuse had swollen to winter proportions, so it could only be crossed at a bridge, and all the bridges were in cities controlled either by Alva or by the Prince-Bishop of Liège, Gerard van Groesbeeck. On 3 November 1568, Orange set up camp outside Liège. The Prince-Bishop of Liège, Gerard van Groesbeeck, neither yielded to demands nor would he permit passage of through his state. Orange's army ransacked some monasteries. The Prince Bishop of Liege, Groesbeck, appealed to Alva for help and initially Alva reinforced Liège and Huy (Dutch: Hoei; Walloon: Hu) with companies of Walloons. Orange, hoping to gain submission of the city and passage for his troops, demonstrated an assault on Liège during the night of 4–5 December, but hearing that Alva’s main army was approaching he abandoned the siege on the morning of 5 December. 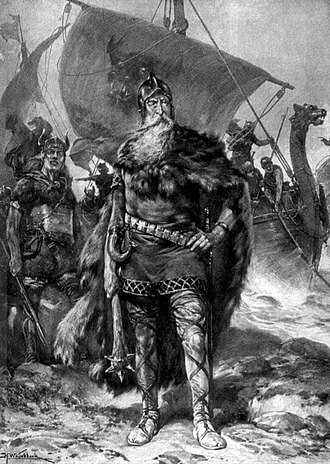 The only option for Orange was to march South-West into Hainault (or Dutch: Henegouwen; German: Hennegau). Alva, with his army, of course, followed. Outside Le Quesnoy (or between le Quesnoy and Cambrai) on 12 November 1568, Orange 's army finally had a good opportunity to fight some of the Spanish army, including 10 German companies of infantry, 8 Spanish companies of infantry and 3 cornets of cavalry. The Spanish were defeated. The Spanish commander Sancho d'Avila, along with his officers Francois de Tolede and Ruy de Lopez were wounded and the son of the Duke of Alva, Don Rufille Henriques died in the action. The fortified town of Le Quesnoy yielded to Orange , to be relieved a few days later by the Spanish. Nearby the fortified town of Le Cateau-Cambrésis put up a fight killing some of Orange 's troops but was also defeated. Genlis and other French officers proposed that Orange should change focus to support the French Protestants or Huguenots. However, most of Orange's army, who had signed on to fight the more lucrative Spanish enemy, would not do that. In that city, Orange disbanded most of his army, yet retained his reputation, by paying the troops, even at the cost of selling the army cannons, his own silverware and mortgaging rights to his lands. With that reputation, Orange would return to the Netherlands in later years to continue the Dutch Revolt. 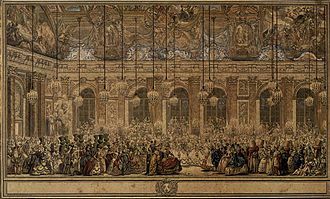 The next step for Orange was to take the rump of his army, some 1,200 cavalry, to join Count Palatine Wolfgang of Zweibrücken who was heading to support the Huguenots in the Third French War of Religion. The Capture of Le Quesnoy was an engagement of the First World War that took place on 4 November 1918 as part of the Battle of the Sambre. By late morning, the linkup had been achieved and other elements of the New Zealand Division moved further west into the Mormal Forest, after mopping up outlying outposts, the New Zealanders moved up to the ramparts of the town, but were held back by machine-gun fire. Late in the afternoon, a scouting party located an unguarded section of the walls, the capture of Le Quesnoy was the last major engagement of the war for the New Zealanders. By mid-1918, the German Army had been fought to a standstill after its Spring Offensive, the Hundred Days Offensive began on 8 August, with an attack on Amiens which marked the beginning of a series of advances by the Allies that ultimately ended the war. By late October, the New Zealand Division, commanded by Major General Andrew Russell, the Battle of the Sambre, which was planned to begin on 4 November, was the next phase of the Allied advance. IV Corps, with the New Zealand Division and the 37th Division, was to surround Le Quesnoy and its garrison of over 1,500 soldiers. The 37th Division was on the flank of the New Zealand Division while to its north, 62nd Division, of VI Corps. The New Zealand Division was to extend the front line to and around Le Quesnoy, positioned on high ground between the Ecaillon and Rhonelle Rivers, Le Quesnoy was a medieval town that had been fought over several times in previous centuries. It guarded a natural approach across plains to the north-east and had walls with ramparts designed by Sébastien Le Prestre de Vauban. A moat surrounded the town and was in two distinct ditches, with 20–30-foot high fortifications, effectively an outer rampart, separating them. The town could be entered by three roads, guarded by gates, Le Quesnoy had a population of 5,000 and had been in German hands since August 1914. On 3 November, the New Zealand Division section of the front line was around 2,500 yards in length and it was 400 yards from the Cambrai railway, with the ramparts of Le Quesnoy a further 400 yards to the east. The Battle of Dahlen was fought on April 23,1568, between a Dutch rebel army led by Jean de Montigny, Lord of Villers, and a Spanish army commanded by Sancho Dávila y Daza. 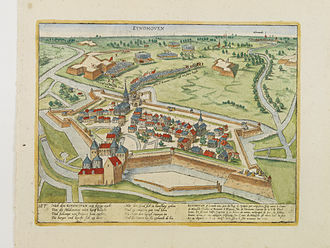 As a part of William of Oranges planned invasion, the Dutch rebels were trying to conquer the town of Roermond when the arrival of the Spanish force compelled them to withdraw, Dávila pursued the retreating force and inflicted a defeat upon Villers near the small town of Dahlen. The survivors of this encounter sought refuge under the walls of Dahlen and this battle is sometimes considered the official start of the Eighty Years War. William, based in Dillenburg, designed a triple attack upon the Netherlands by his rebel followers, Villers was expected to raise the country and to take an important city to serve as a base for a large offensive. The city selected was Roermond, a town of considerable size situated at the confluence of the Meuse. As soon as he received news of the invasion, Alba organized an army to secure Maastricht. He ordered the maestre de campo don Sancho de Londoño to move his tercio from the village of Lier up to Maastricht, in all the small Spanish army numbered about 1,600 men. While being searched by the Spanish and his army passed through Eijsden, they tried to enter the town pretending to be soldiers of the King of Spain, but the towns inhabitants were not fooled. Then the rebels resorted to their weapons and attempted to seize the towns gates, fearing that they would be caught by the Spanish, Villers decided to withdraw, taking the road to the Guelders exclave of Erkelenz. There were some doubts on the Spanish side about what to do then, Londoño advised caution, but Dávila decided to pursue the rebels, seeking to gain a victory that would serve as a warning for them. Sancho Dávila went ahead with his cavalry and was informed by his scouts that the rebels were close to the village of Erkelenz, there Villers found his path cut off because a nearby bridge over the Rur river had been demolished. Nord-Pas-de-Calais (French pronunciation, is a former administrative region of France. Since 1 January 2016, it is part of the new region Hauts-de-France and it consisted of the departments of Nord and Pas-de-Calais. Nord-Pas-de-Calais borders the English Channel, the North Sea, the majority of the region was once part of the historical Netherlands, but gradually became part of France between 1477 and 1678, particularly during the reign of king Louis XIV. The historical French provinces that preceded Nord-Pas-de-Calais are Artois, French Flanders, French Hainaut and these provincial designations are still frequently used by the inhabitants. Its administrative centre and largest city is Lille, other major towns include Valenciennes, Douai, Béthune, Maubeuge, Arras and Saint-Omer. Nord-Pas-de-Calais combines the names of the constituent departments of Nord and Pas-de-Calais, the regional council, spells the name Nord-Pas de Calais. The northern part of the region was historically a part of the County of Flanders and those who wish to evidence the historical links the region has with Belgium and the Netherlands prefer to call this region the French Low Countries, which means French Netherlands in French. Other alternative names are Région Flandre-Artois, Hauts-de-France, and Picardie-du-Nord, see also, History of Nord-Pas-de-Calais Inhabited since prehistoric times, the Nord-Pas-de-Calais region has always been a strategic regions in Europe. French President Charles de Gaulle, who was born in Lille, over the centuries, it was conquered in turn by the Celtic Belgae, the Romans, the Germanic Franks, the Spanish and Austrian Netherlands, and the Dutch Republic. After the final French annexation in the early 18th century, much of the region was occupied by Germany during the First. By the 9th century, most inhabitants north of Lille spoke a dialect of Middle Dutch and this linguistic border is still evident today in the place names of the region. Beginning in the 9th century, the border began a steady move to north. By the end of the 13th century, the border had shifted to the river Lys in the south. Boulogne and Flanders were fiefs of the French crown, while Hainaut, Calais was an English possession from 1347 to 1558, when it was recovered by the French throne. The siege of Haarlem was an episode of the Eighty Years War. From 11 December 1572 to 13 July 1573 an army of Philip II of Spain laid bloody siege to the city of Haarlem in the Netherlands, after the naval battle of Haarlemmermeer and the defeat of a land relief force, the starving city surrendered and the garrison was massacred. The resistance nonetheless was taken as an example by the Orangists at the sieges of Alkmaar. The city of Haarlem initially held a view in the religious war that was going on in the Netherlands. It managed to escape from the Reformed iconoclasm in 1566 that affected other cities in the Netherlands, when the city of Brielle was conquered by the Geuzen revolutionary army on 1 April, Haarlem did not initially support the Geuzen. 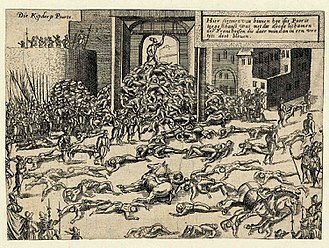 The ruler of Spain was not pleased, and sent an army north under command of Don Fadrique, on 17 November 1572 all citizens of the city of Zutphen were murdered by the Spanish army, and on 1 December the city of Naarden suffered the same fate. The city administration of Haarlem sent a deputation of 4 people to Amsterdam to attempt to negotiate with Don Fadrique, the cities defenses were commanded by city-governor Wigbolt Ripperda, a commander put in charge by William the Silent, the Prince of Orange. He strongly disapproved of negotiating with the Spanish army, called the city guard together, the citys administration was replaced with pro-Orange citizens. When the deputation came back from Amsterdam, they were convicted as traitors, the Sint-Bavokerk was cleared of Roman Catholic symbols the same day. On 11 December 1572 the Spanish army laid siege to Haarlem, the city was not very strong, militarily speaking. Although the city was surrounded by walls, they were not in good shape. The area around the city could not be inundated, and offered the enemy many places to set up camp, the existence of the Haarlemmermeer nearby made it difficult for the enemy to cut off the transportation of food into the city completely. In the Middle Ages it was unusual to fight in the winter, during the first two months of the siege, the situation was in balance. The Spanish army dug two tunnels to reach the city walls and collapse them, the defenders made tunnels to blow up the Spanish tunnels. 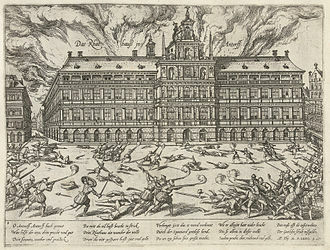 The situation became worse for Haarlem on 29 March 1573, the Amsterdam army, faithful to the Spanish king, occupied the Haarlemmermeer and effectively blocked Haarlem from the outside world. 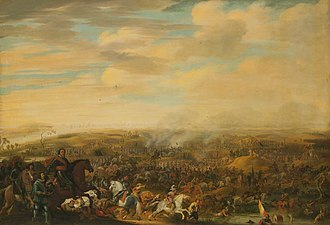 The Siege of Zutphen was an eleven-day siege of the city of Zutphen by Dutch and English troops led by Maurice of Nassau, during the Eighty Years War and the Anglo–Spanish War. The siege began on 19 May 1591 after a clever ruse by the besiegers, Zutphen was a Hanseatic city on the east bank of the River IJssel. 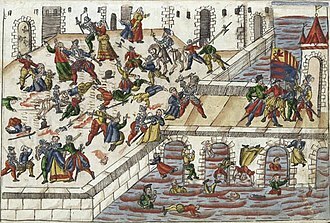 In 1572, with the resurgence of the Dutch rebellion against Philip II of Spain, the city was recaptured by the Spaniards led by Don Frederick, and the population was punished and slaughtered for the surrender earlier that year. York subsequently died there of smallpox a year although he may have been poisoned by the Spanish to keep him from betraying again. As a consequence the town of Deventer soon followed, handed over to the Spaniards by William Stanley. In 1590 Maurice had taken Breda by hiding soldiers within a peat barge and was able to use Breda as a base for further operations. The Dutch army could launch an offensive at three points, to the South, to the East and to the North, Maurice chose the East with the towns along the River Ijssel heading towards Nijmegen. By the beginning of 1591 Maurices first goal was to take back Zutphen, with the parallel waterways he could move the troops and artillery as quickly as possible and keep the Spanish from reinforcing the besieged towns. The garrison of Zutphen itself consisted of nearly 1,000 Spaniards and Walloons, Maurices army consisted of 9000 soldiers and 1600 horsemen which marched to Zutphen, along with 100 ships. In order to take Zutphen, the sconce on the west bank of the river had to be taken, once this had been taken the town could be besieged proper once all the heavy guns from the barges had disembarked. Maurice hoped to use another ruse similar to the one he had used at Breda with the peat barge, Francis Vere, in charge of the English troops, wanted the dirt removed from the 1587 treachery and thus wanted to lead the assault. Vere got his wish and Maurice ordered him to take the sconce on the Veluwe opposite Zutphen by sending no more than a dozen men and disguise them as farmers, some even dressed as women. The Destruction of Neuss occurred in July 1586, during the Cologne War. Alexander Farnese, Duke of Parmas troops surrounded the city of Neuss, in total, approximately 3000 civilians died, out of a population of approximately 4500, and the entire garrison was killed. Neuss had been seized by supporters of the Protestant Prince-Elector Gebhard Truchsess von Waldburg in February 1586. Adolf, Count of Moers and Neuenahr and supplied the city and took most of his troops north, to Moers and Venlo, Cloedt had a garrison of 1600 men, mostly Germans and Dutch soldiers, some had military experience, but many were recent recruits. In June, the Duke of Parma approached the city and surrounded its landed fortifications, he was supported by Karl von Mansfeld, Francisco Verdugo, the next day, being the feast of St. Once the cannonade began, Parmas 45 artillery pounded at the walls for 30 hours with iron cannonballs weighing 30 to 50 pounds, the Spanish made several attacks, each repelled. With the ninth assault, the wall was breached, and soldiers poured into the city, the Italians from one end. They met in the marketplace in the middle, gravely injured, had been carried into the town. The Spanish and Italian forces entered the town from opposing ends, Parma was reportedly inclined to honor the garrison commander, Ernst demanded his blood. Soldiers found Cloedt and the man was hanged from the window. Italian and Spanish soldiers, on their rampage through the city, slaughtered the rest of the garrison, who had taken refuge in some of the churches, were initially spared, but when the fire started, they were forced into the street. Parma wrote to the king that over 4000 lay dead in the ditches, english observers confirmed this report, and elaborated that only 8 buildings remained standing. Although Parma had taken the city, his Protestant opponents took some comfort in the fact that the city had been destroyed in the process and was of no use as a garrison. Parma had nearly unfettered access to the Electorates northern regions, called the Niederstift, Gebhard renounced of the Electorate in 1588. In August 1572, during the course of the Eighty Years War, the city of Goes, in the Spanish Netherlands, was besieged by Dutch forces with the support of English troops sent by Queen Elizabeth I. This was a menace to the safety of the city of Middelburg. The surprise arrival of the Tercios forced the withdrawal of the Anglo-Dutch troops from Goes, allowing the Spanish to maintain control of Middelburg, in 1567 the hostilities increased, leading to the Eighty Years War. In April 1572, the Sea Beggars, Dutch rebels opposed to Spain, took Brielle, the first city conquered during the war. On 26 August 1572, in command of 7,000 soldiers among which were 1,500 English under Thomas Morgan and Humphrey Gilbert, the Spanish garrison of Goes, much inferior in number, would not withstand the siege for long without reinforcements. The presence in the area of the fleet of the Sea Beggars under Ewout Pietersz Worst prevented it, the river Scheldt was divided into two branches flowing in different directions before it disembogued into the North Sea, the Oosterschelde flowed to the north, the Westerschelde to the west. Between these two there were the islands of Walcheren and Zuid-Beveland, in the northern part of which laid Goes. The area between Brabant and Zuid-Beveland was largely a flat floodplain exposed to the tides of the North Sea and the river currents of the Scheldt, channels of which intersected the mudflats. When the tide went down the channels had between 1 and 1.5 meters of depth, and when it rose the depth in the main channel reached three meters. 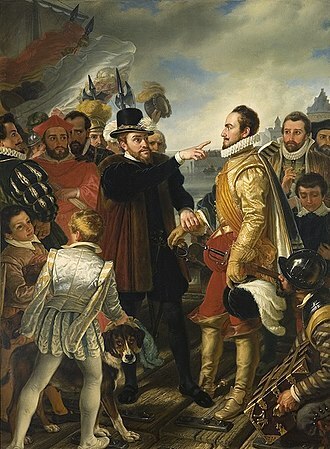 Plomaert’s plan was presented to Sancho Dávila and Cristóbal de Mondragón, for its execution Mondragón assembled a force of 3,000 Spanish and German pikemen of the Tercios at Woensdrecht. Shortly before dawn they reached the riverbank of Zuid-Beveland near Yerseke, at 20 km of Goes, at the end of 1572, Arnemuiden and Rammekens remained under Spanish control. The island of Schouwen, including Zierikzee, was held by the Dutch forces until its recapture in 1576 by Luis de Requesens, English warfare, 1511–1642, Warfare and history. The Rise of the Dutch Republic, Entire 1566–74, history of Holland, from the beginning of the tenth to the end of the eighteenth century. The New Zealand monument commemorating the liberation of Le Quesnoy.